Brace yourself. And your livestock. And your crops. And everything else on your farmland. Because unfortunately, winter is indeed coming. While it won’t be bringing any zombies (we hope), it will still be carrying some frigid temperatures, freezes, and of course blankets of snow along with it, all of which can impact your ability to farm. Fortunately, there are some precautions in place which you can take in order to prepare your farm and its inhabitants for the winter season. Whether you’re a dairy farm owner in Greeley or you grow crops across the border in Nebraska, our agriculture consultants and development experts are here to help you prepare, plan, and manage your farm so that it operates at maximum efficiency all throughout the year — not just the peak summer months. That’s because we know for many, the work doesn’t stop when the sun goes into hiding. Farming is more than just a seasonal hobby, it’s a year-round lifestyle which helps provide necessary goods. 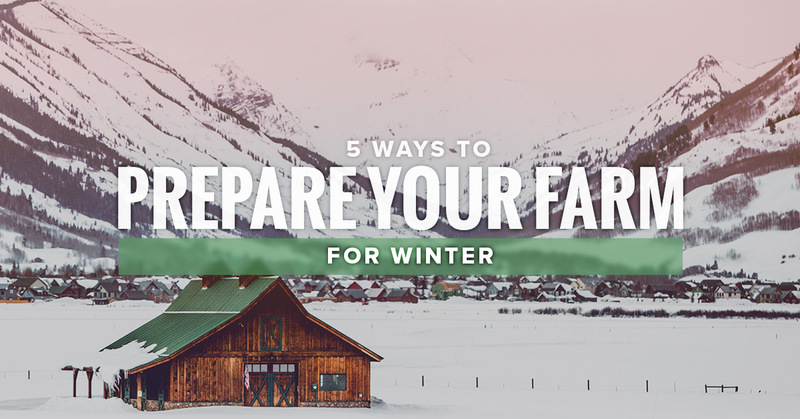 So, with that being said, let us help you prepare your farm for winter with these five key tips. Whether you have poultry, livestock, or other friendly furry critters running around your farm, it’s imperative that they have a safe, sheltered place during the winter where they can remain warm, or at least out of harm’s way. Make sure there’s enough room in your dairy barn or other shelter has enough room for every animal to fit comfortably. Additionally, you should make sure they have plenty of accessible feed (hay, straw, etc.) located in a space that won’t get wet or contaminated. One thing you can’t afford once the spring thaw rolls around is to have equipment that was damaged by the wet and the cold. Have in place a plan to store your equipment, including lawnmowers, hoses, and even heavy machinery in a warm, dry, safe place until they are needed once again. It’s still early in the fall, which means if you’re growing crops on your farm, now is the perfect time to get your soil the nutrients it will need to be prosperous. “Feeding” your soil with nutrient-rich fertilizers and compost, which will break down slowly over the course of the next few months, will enrich your farm’s soil and ensure that it’s ready for planting come spring. Sure, you’ll want to spend as many days as you can curled up by the fire this winter. But like we said earlier, the work on the farm never really stops, even when the snow is coming down along with the temperatures. Make sure you are well-equipped to handle any and all situations, from dealing with leaks on the barn roof to fixing that fence out in the pasture. Make sure you have gloves, scarves, thermal underwear – everything to keep you warm and safe during outdoor work in the snow and frigid temps. Still not sure what else you need to brace for winter? The agricultural development consultants at AGPROfessionals can help. Whether it’s your first winter on the farm or your 50th, our experienced consultants can help guide you through the environmental and geotechnical challenges presented by a new season. Contact us today to learn how we can help!